As reported by ARTINFO, Artist Shepard Fairey has been involved in a long running legal battle with the Associated Press over the famous poster, Obama Hope, that he created using one of the agency's photographs of Barack Obama. However, that may now be over. 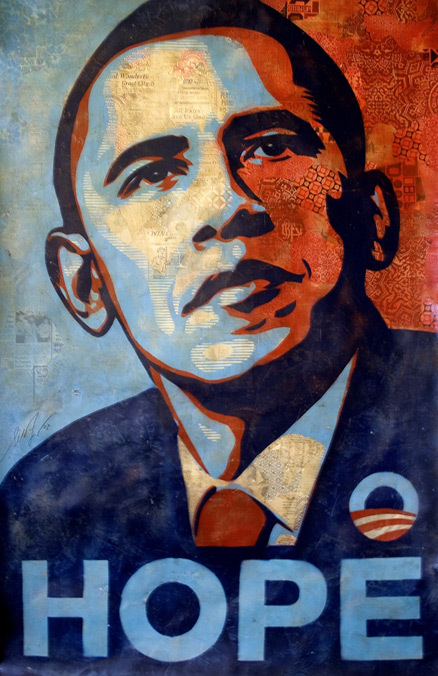 Fairey turned the photograph of Obama into a pop-art-style poster, entitled Obama Hope, back in 2008, and filed a federal suit in 2009 in order to gain a declaratory judgement finding that his appropriation of the image was protected under the United States "fair use" statute. This statute allows for the limited use of copywritten material for creative purposes. The case now seems to be at an end, with neither side backing down. Instead discussions are moving from the courtroom into the boardroom, with Fairey now looking set to collaborate with the Associated Press in sharing the right to benefit from the production and sale of the Hope posters, and use of that image.